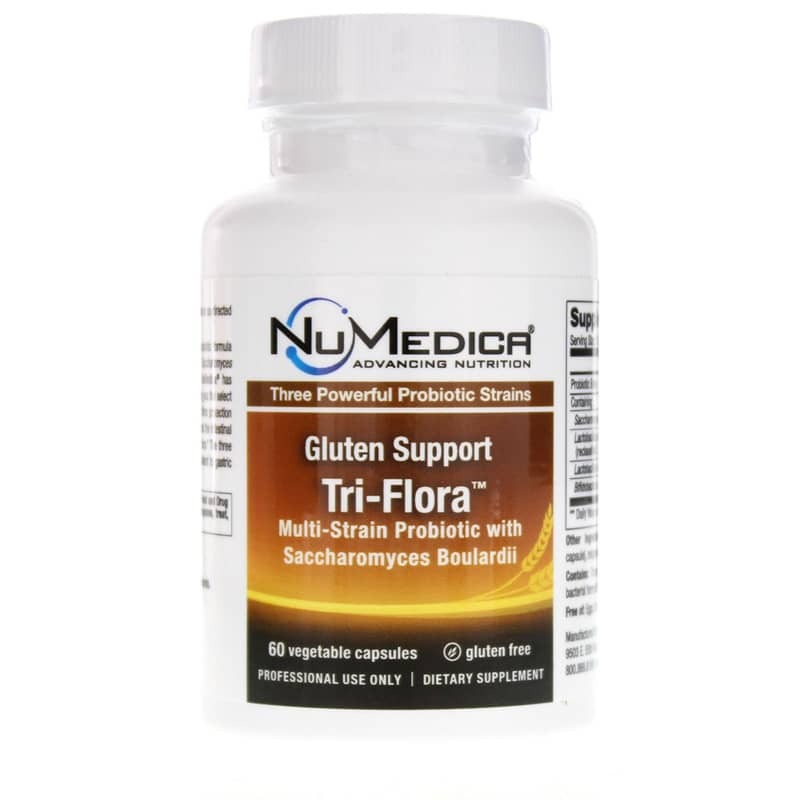 Gluten Support Tri-Flora from NuMedica is a unique probiotic supplement featuring a concentrated and synergistic blend of three beneficial bacteria strains, including saccharomyces boulardii. This formula helps support a healthy balance of intestinal flora while also protecting the gastrointestinal system from pathogens. Ships tomorrow if you order in the next 21 hours 4 minutes. Probiotic supplements can be beneficial to the overall health and wellbeing of nearly every individual, but some individuals need extra support. If you're gluten intolerant or sensitive, choose a probiotic supplement designed just for you. Choose Gluten Support Tri-Flora. Comprehensive and synergistic, Gluten Support Tri-Flora is a multi-strain probiotic supplement. 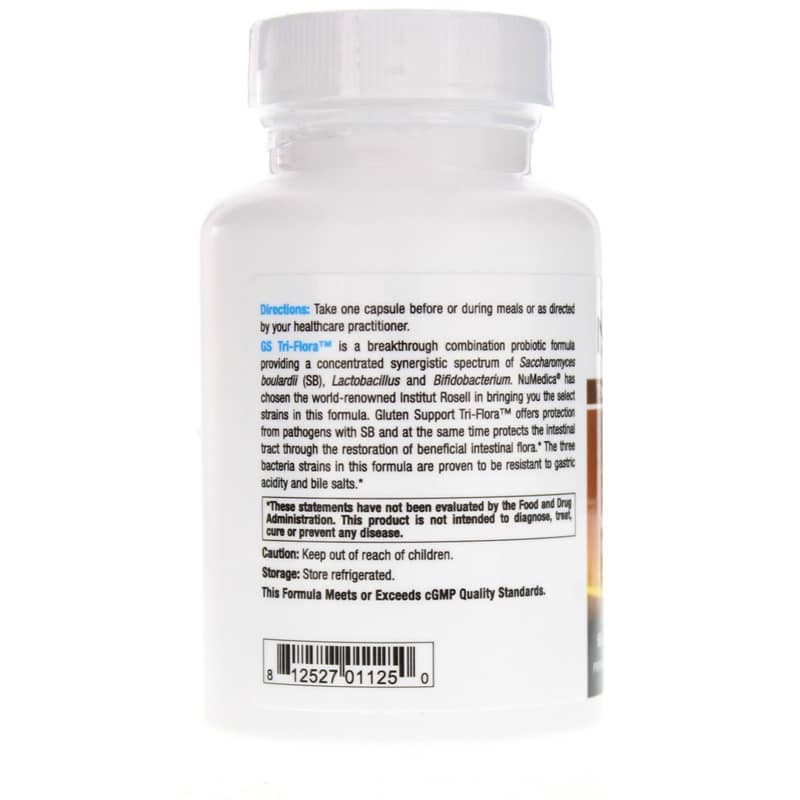 Each capsule provides 5 billion live organisms from lactobacillus acidophilus and rhamnosus, Bifidobacterium longum, and saccharomyces boulardii. 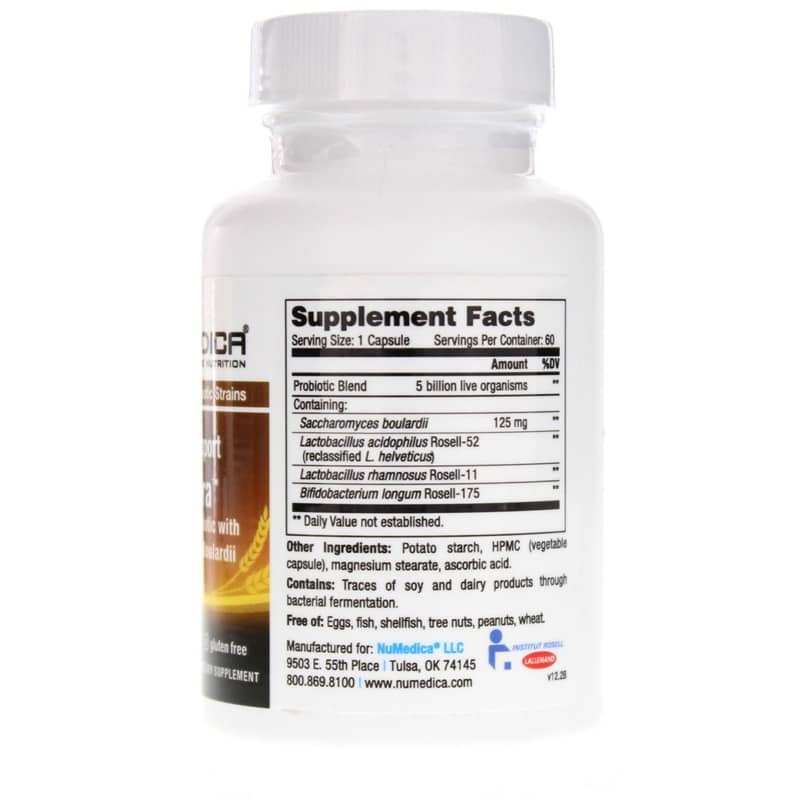 Saccharomyces boulardii is particularly beneficial for overall health as it provides protection from pathogens that may enter the gastrointestinal system, all while working with lactobacillus and Bifidobacterium to support a healthy balance of beneficial intestinal flora. Gluten Support Tri-Flora is made using world-renowned Institut Rosell bacteria strains, which are designed to be resistant to gastric acidity and bile salts, so you get the most benefit possible. Order the right probiotic for your unique needs. Order Gluten Support Tri-Flora. Other Ingredients: Potato starch, HPMC (capsule), magnesium stearate, ascorbic acid. Contains: Traces of soy and dairy products through bacterial fermentation. Contains NO: gluten, fish, shellfish, tree nuts, peanuts, wheat. Adults: Take one capsule before or during each meal or as directed by your healthcare practitioner.